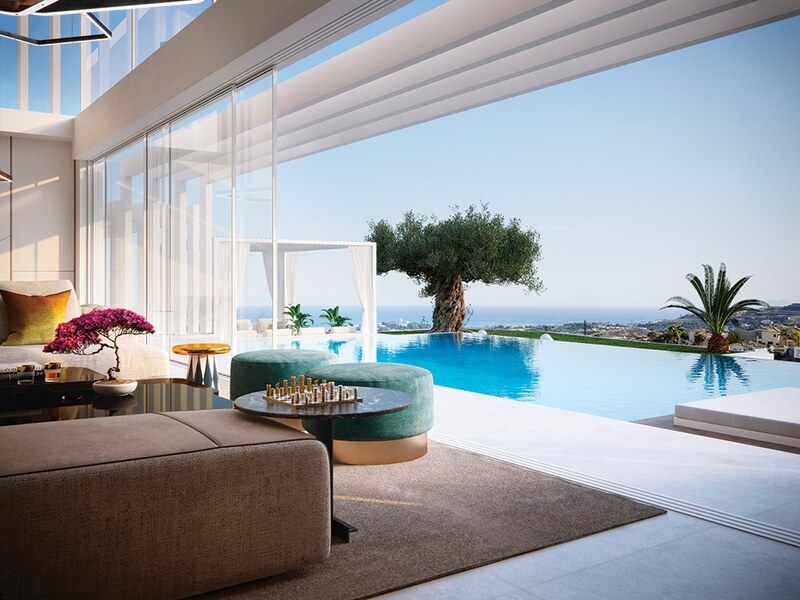 Our Showcase property is a beautiful house overlooking the Spanish Mediterranean, whose interior design does justice to its architecture, its location, the natural materials used in its construction and the concept of exquisite taste. Think of a wood and stone house beside the sea, and think again. Because this is what the designers of this Showcase did, and the result is stunning. 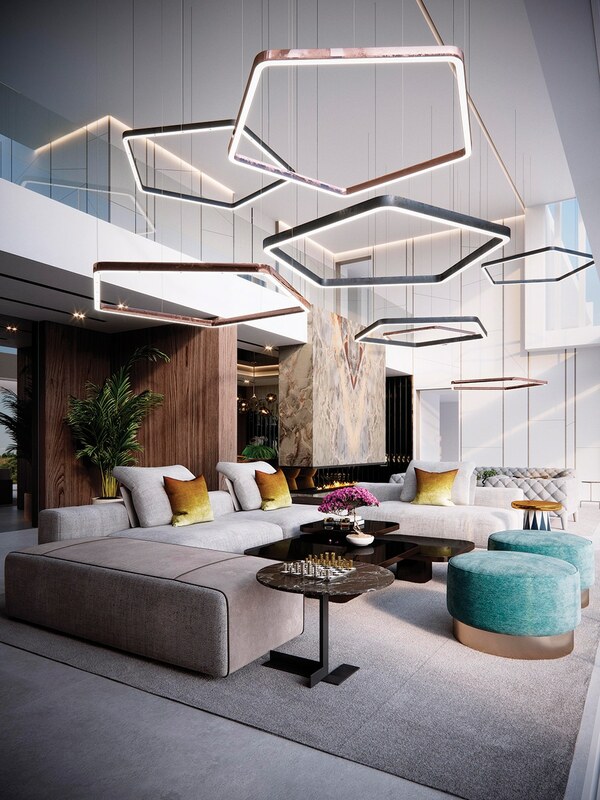 Using the same natural materials that have been used for millennia, but with a touch of opulence and a lot of creativity, they take pride in showing us around a house that is beautiful, comfortable, practical and unique. 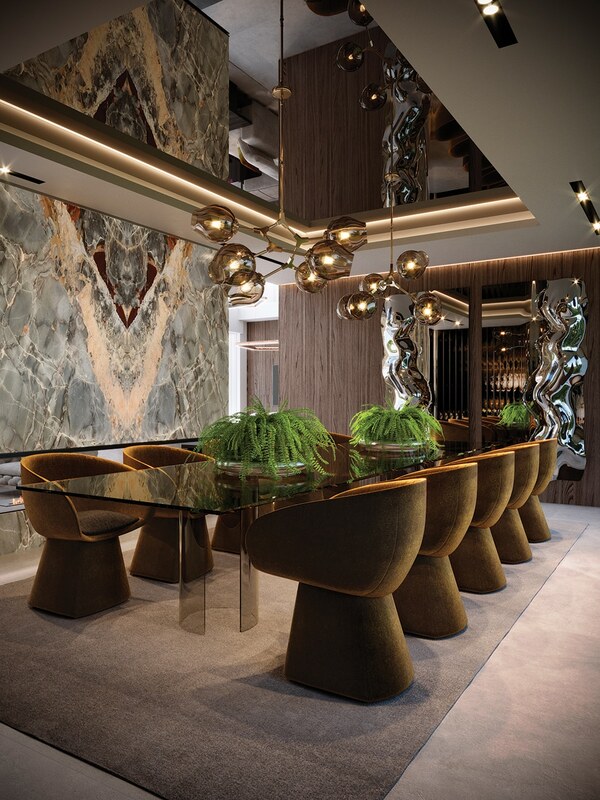 One would assume its main design feature is the extensive use of onyx and walnut panelling, but it could be all the features together, from the fabulous pieces of designer furniture and fittings to the mirrored ceiling over the formal dining table or the fact that the kitchen, with its panelled Calcutta ceramic tiles, is unlike any we’ve ever seen before. 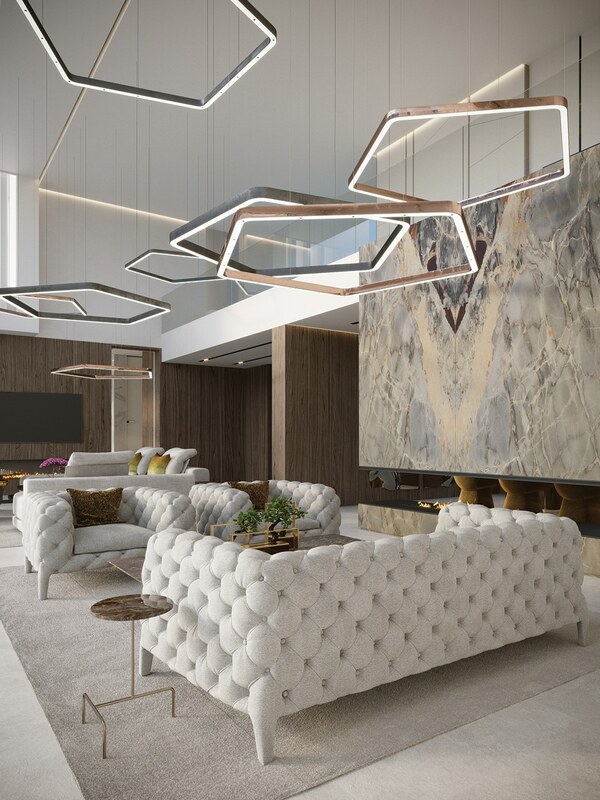 Above: Lounge: the pale tones, including the off-white velvet Capitone sofas with brass and steel Henge lamps overhead, and the slabs of onyx and walnut panelling, are brightened by splashes of fresh Mediterranean colours in the cushions and pouffes. Or it could be the overall tone of the house achieved by the perfect blend of texture, material and colour throughout, both natural and manmade. But searching for a single feature that stands out from the rest is probably misinterpreting the concept of wholeness in the overall design. Above: Formal Dining area. 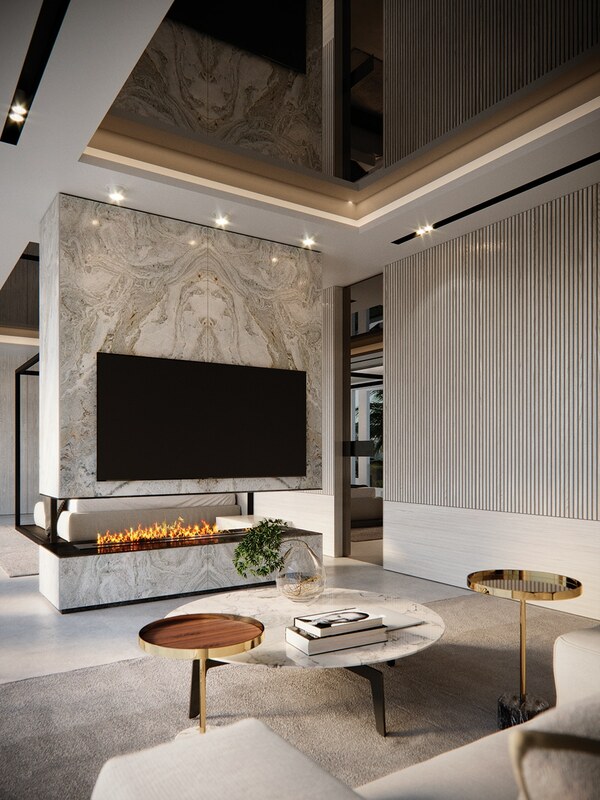 The rich stone and wood textures of the onyx wall, floating over a natural fire, the walnut panelling and the subtle lighting bring warmth (both literally and metaphorically) to this opulent space. 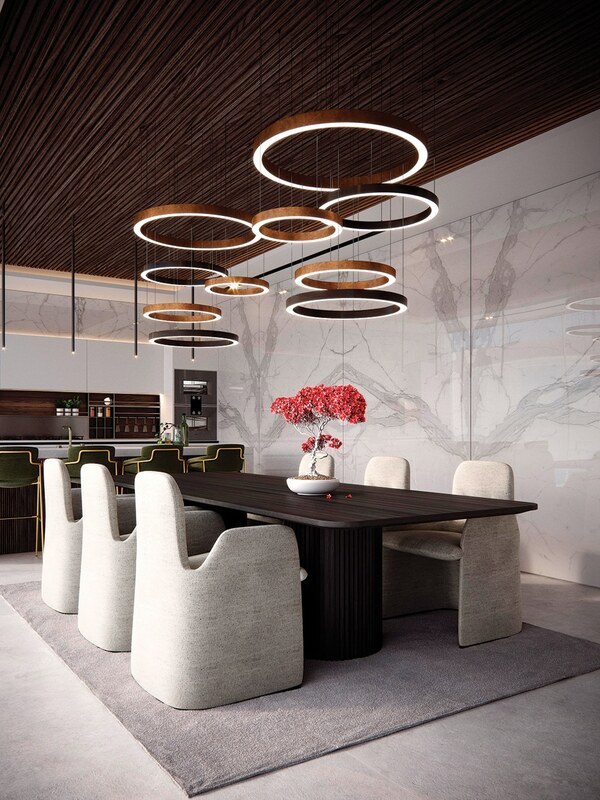 Above: A Kitchen that looks like a dining room you can cook in, its large circular Henge lamps overlooking a dark wood table and light velvet chairs. Brass stools at the counter complete the picture. 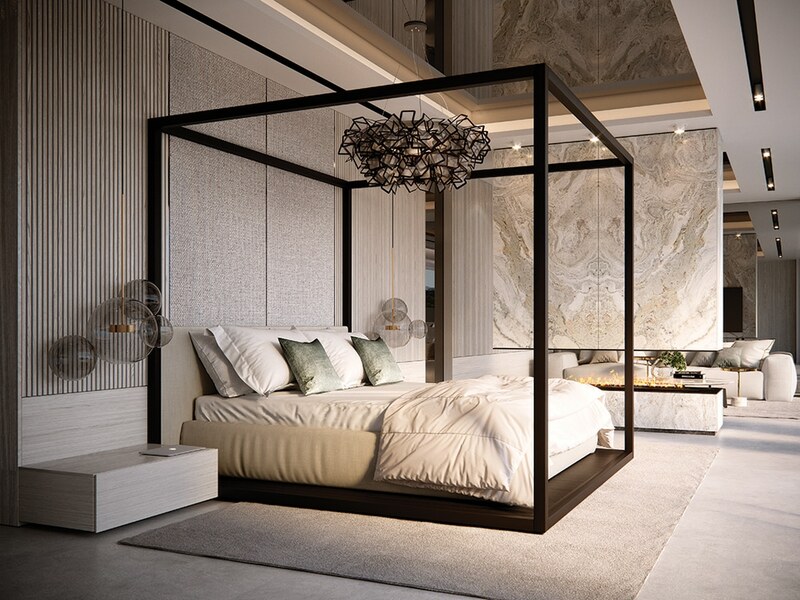 Above: Master Bedroom: the main feature of the room, the 4-poster bed, is divided from the seating area by a floating wall of travertine marble, allowing the fire to be enjoyed from both areas. Wood and stone, two natural materials that become less common when used uncommonly, alongside the restrained use of other materials that do not overshadow them. If the essence of good design is less, there is a great deal of it here. And that’s also the essence of good living. 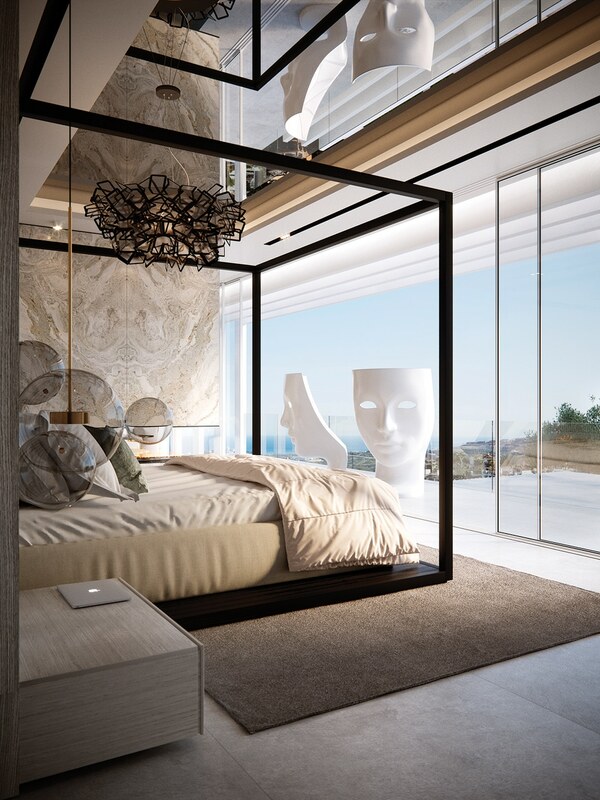 The tour of our Showcase property ends with a view from the bedroom. For more information about any proposal you might have, don’t hesitate to contact us for a presentation. Apart from a few pieces of specially selected leading brands, most of the furniture, including the kitchen, was custom-made by UDesign.